A common site for any homeowner during the summer is Japanese beetles. The pest is an unwelcome visitor for most gardens and lawns. Not only is it a danger to any plants that you might have, but these beetles can harm your lawn as well. So how can you protect your plants and lawn? Japanese beetles are notorious for destroying trees and shrubs such as birch, maple, and rose bush just to name a few. They favor certain plants over others, and will typically eat the leaf material on the plant, which will leave the entire thing looking skeletal. When it comes to your lawn, the danger won’t be as noticeable right away. Female Japanese beetles will bury into your lawn and lay their eggs there. Once those eggs hatch, the larvae (also known as grubs) will feed on the root system of the lawn. This will leave the entire lawn damaged and the only solution at that point would be to completely reseed. These grubs are the real danger because they do damage without you even knowing. 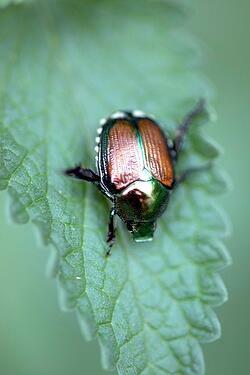 For Trees & Shrubs- As mentioned earlier, Japanese beetles are attracted to certain types of plants. One option to keep these beetles away is to plant trees and shrub that don’t attract them or even deter them. You can check out a great list of those plants here. Another option is to have a proper plant health care program. You can read about Weed Pro’s here. For Your Lawn- It’s much harder to keep your lawn protected, because you cannot always see the damage being done. The best option here is to keep your lawn healthy and have a lawn care program that include a grub preventative. A grub preventative will kill any grubs before they begin to feed on the roots of your lawn. One of the great benefits of having a lawn care company is that they have programs that can keep your lawn, trees, and shrubs protected. If you are thinking about hiring a lawn care professional, check out our FREE Hiring Guide! It has all the things you need to know to pick the right company for you. Download this FREE guide today! Just click below!